With its stunning mountains, fascinating old towns, beautiful lakes, and long history, Switzerland is the perfect vacation offering something for everyone. On this Best of Switzerland tour, experience some of its most beautiful scenery and interesting cities with overnights in Zürich, St. Moritz, Lugano, Zermatt, Lake Geneva, and Lucerne. Plus, you 'll travel to Germany to overnight in Munich and Oberammergau, where you 'll see the world-famous Passion Play, held every 10 years. No tour to Switzerland is complete without seeing the stunning scenery. Enjoy a scenic drive following Lake Zürich and Lake Walen through the high Alps to the tiny Principality of Liechtenstein. Also drive to the Swiss Engadine, a valley considered by many as the world 's most beautiful mountain area, with deep-blue lakes, airy larch forests, mountain peaks exceeding 12,000 feet, and quaint villages. Here, enjoy St. Moritz, one of the world's most famous resorts. Other mountain scenery awaits you in Täsch, where you 'll board a mountain train to car-free Zermatt, a picturesque cluster of rustic chalets beneath the famous Matterhorn. If you desire to see lakes, you'll enjoy Lake Como, stunning Lake Geneva, and Lugano, the popular subtropical resort on the shores of Lake Lugano. 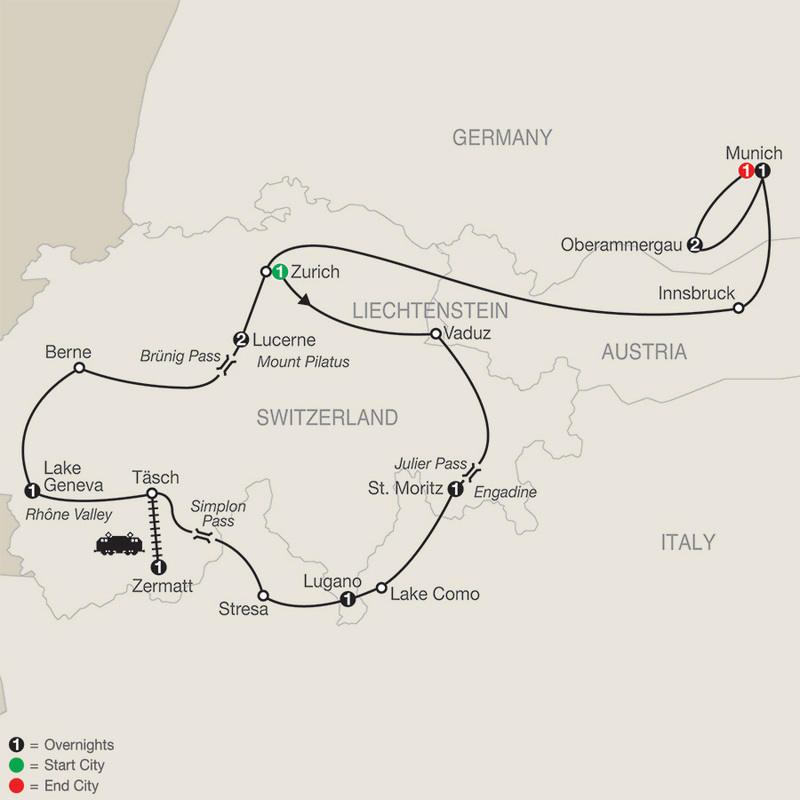 You'll also visit some of Switzerland's famous cities, including Zürich, Berne, and Lucerne. Plus, to bring Switzerland to life, Globus has arranged some unique experiences for you, such as a traditional Swiss working farm in Berne. Another true Swiss experience is a trip to the top of Mount Pilatus to enjoy heavenly views. You'll even get a special souvenir cap to remember this experience! Of course, Switzerland is known for its chocolates, and on this Switzerland tour, you'll taste traditional chocolate pralines. From stunning scenery and vibrant cities to special experiences and the incredible Passion Play, this Switzerland tour—with Oberammergau—is sure to delight. Motorcoach; mountain train. Free wi-fi available on your motorcoach and in most hotel lobbies.